I kept seeing Sally Hanson’s Miracle Gel in magazines, and decided to give it a try. It’s gel polish, but doesn’t need a heat lamp and comes off like regular polish. 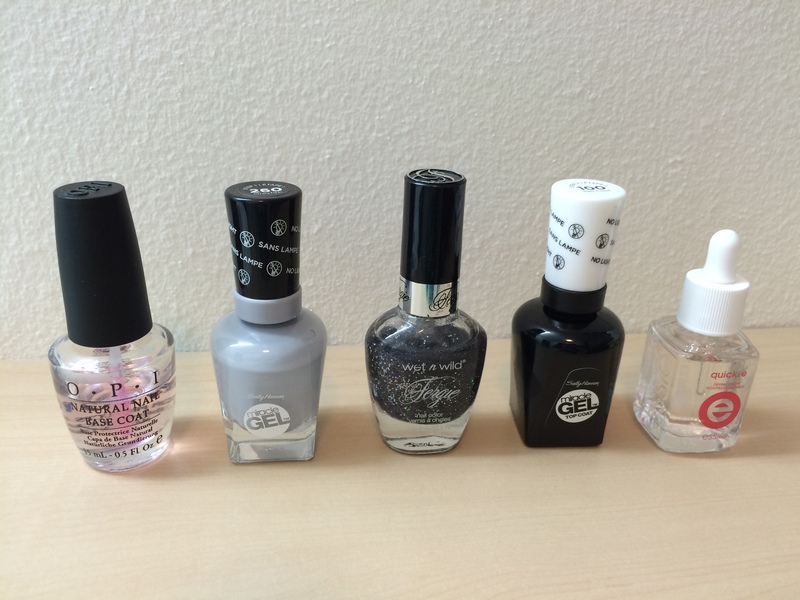 I didn’t realize this on my first try, but you need to buy the nail polish and the top coat (black bottle, says “step 2” on top). I love the look of painted nails, but I am so lazy. I can’t stand polish when it’s chipped, which generally happens for me about three minutes after it dries. Gel polish is great, but I have no patience for the removal. I also don’t want to pay $30 plus tip, then go back to get it removed. Here’s what I did for this manicure. I started with OPI’s base coat, which I love for the extra wide brush. 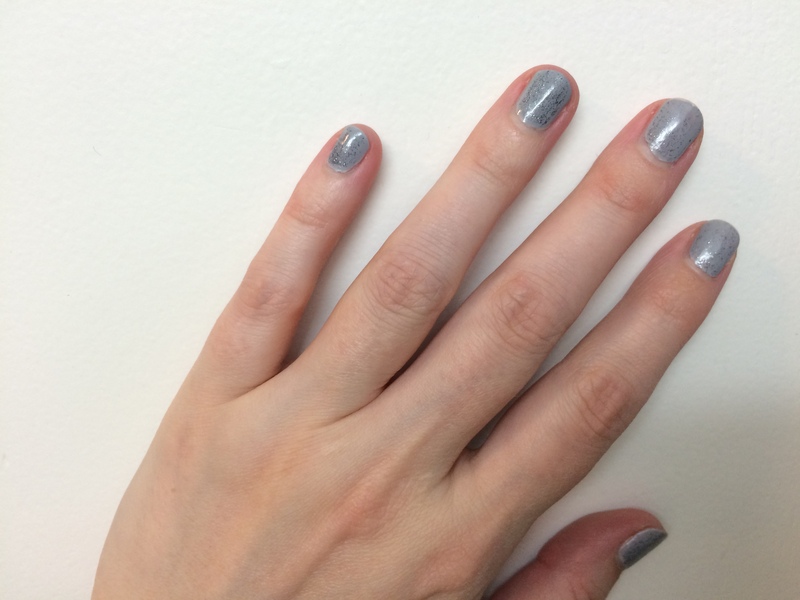 Then I used Essie’s quick-e drying drops (and used them after every coat). These actually do help coats dry faster, which is great (again with my total lack of patience). I did two coats of Sally Hanson’s Miracle Gel Grayfitti, one coat of Wet n Wild Fergie Rock n’ Roll, and a coat of Sally Hanson’s Miracle Gel Top Coat. The drying drops made this go pretty quickly. They looked great and I didn’t see any wear until day five (when I was already starting to see growth, so I probably couldn’t have worn it much longer anyway). Here are the pictures after five days- I’m really impressed. I will have to play around and see if it lasts longer if I don’t use a non Miracle Gel sparkle in between the polish and top coat. 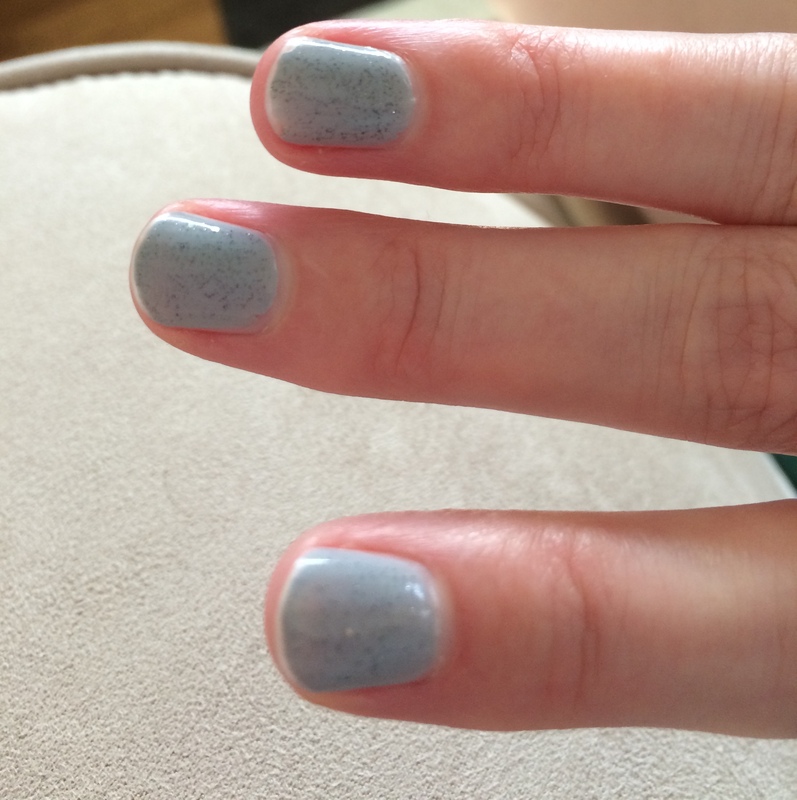 Note- I did try it with just the Miracle Gel polish before I got the top coat. It lasted about three days, so the top coat does make a different. I used regular OPI top coat the first time. Traditional gel polish can last on me with no chips for about a week, but I see growth after five-seven days. I think this is a much better alternative! I got these products at my local grocery store, but they are available on Amazon if you want more colors or just don’t want to go out (confession~ it’s a miracle I bought these in person. I buy almost everything on Amazon. It’s almost embarrassing.). These are all affiliate links (if you use them I get a small commission). Im like you: no patience. So, I will definitely have to give these a try. Your mani looks fab. Reminds me of a robin’s egg. 🙂 thanks! you should try them! I may have bought three more colors… Very hard to resist! Just add the sparkles for the robin egg look. Nice I want to try! Maybe we should paint our nails as well as my sign Saturday!